One thing I love about having a “smaller” home (with no front or back yard) is that there isn’t a whole lot to decorate. 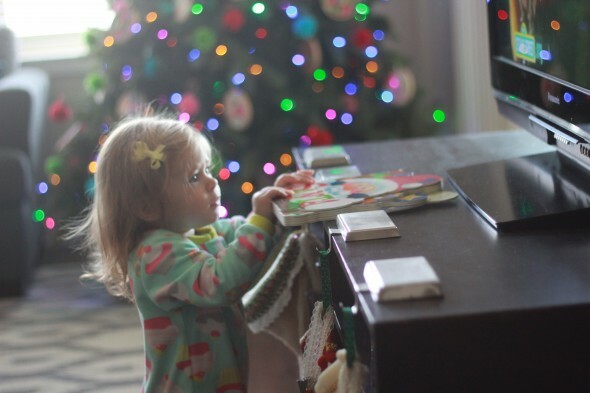 Add in the fact that you have a curious toddler and you have even less space to decorate! So, decorating for me takes very little time and I love that. Matt was a gem of a husband and got in line at Home Depot at 5:10AM on Black Friday to get our tree… in the pouring rain. I am in love with the tree (and him!)!! It’s really full with two different kinds of leaves/branches, it has a remote control, it can be all white lights or all multi-color lights and it has EIGHT different light settings. Mark my word, I’m never getting rid of this tree. It was regularly priced at $200, but we got it for $80. I always change up my Christmas decor a little each year, usually the colors. And I’m not sure why I do this, but I do. This year our colors were lime green, red, turquoise and hot pink. I wasn’t sure how it was going to look, but a week or two after I started all our decorations I received my HGTV magazine and lo and behold these 4 colors were the color theme of their holiday decor. I have been pleasantly surprised that Charlotte has pretty much ignored the tree (and the wrapped presents underneath it). 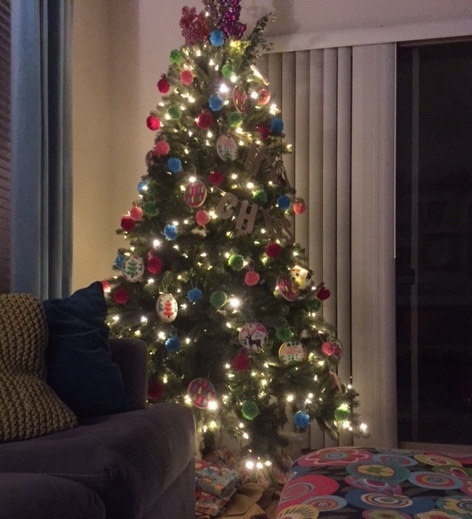 She was a little curious when we first put it up- had to check out the lights and embroidery hoops, but after the initial curiosity, she’s pretty much let it be. I put up our fake 4′ tree that we had last year in case she was too curious with the main tree. She’s let her tree be as well. In years past we’ve hung our stockings from our low entertainment center. I thought for sure Charlotte would by constantly pulling them down, but she’s only pulled them down once or twice. Yay, Charlotte! There’s something so magical about a Christmas tree all lit up night. It makes me want to stay up past my bedtime e v e r y night so I can enjoy every moment of it because the month truly does fly by too fast. I just love your blog. So many great ideas and Charlotte is just too cute!!! Your colors throughout are gorgeous. 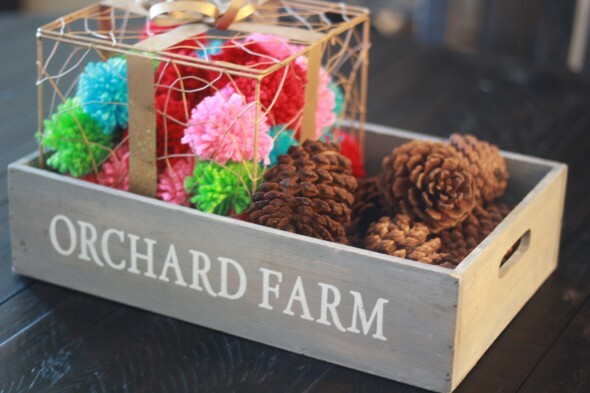 Love the cute ways you’ve used all the pom poms. Don’t know where you found the time to make all those embroidery hoop ornaments. DARLING!!! !